Each period of seasonal change is unique. This year in the southeast, we’ve been blessed with mild weather late in the season. The calendar shows it’s the Christmas Holiday period but frequent daytime temperatures in the fifties and sixties provide poor confirmation. Warm sunny days offer good conditions for fishing but send a false message to some anglers who want to get on the water, enjoy the warming sun, and revisit the good fall fishing they found a month ago. But many fish have moved or aren’t receptive to the same lures and methods of presentations that were effective then. However, for those who recognize how to adapt to lower water temperatures in area lakes and rivers, good fishing awaits. I’ve recently switched my fishing focus to species most active in cold water. Rainbow and brown trout, striped and hybrid bass, walleyes and muskies are cooperative adversaries this time of year and all offer good fishing. Also, it’s a good time of year to fish for some warm-water species like bass and channel catfish because they’re often grouped in large schools, if you know where to find them. Day length is shortest in mid-December so I’ve tightened my traveling range to permit fishing longer during daylight hours. It may feel warm in the sun on a mild early winter day but when it sets, air temperature drops quickly, especially on the water. Because I’m fishing closer to home, my list of fishing destinations has shrunk to several reservoirs, a few tail-waters, and forty or fifty miles of river. I’ll have to make the best of it until spring. Male brown trout have vivid colors during the fall spawning season. weather. It was far from a banner day but a good way to catch some beautiful fish on a sunny afternoon. When conditions are more favorable, catch rates and average size of trout are higher on waters I fish and some days are surprisingly good. Last week I had a few hours to fish and slipped away to a favorite tail-water. It was a mild, overcast day with light winds the day before a major moon phase; ideal conditions for any type of fishing. There wasn’t a single vehicle in the parking lot when I arrived so I backed up to the ramp and jumped out to unhook the boat. As I walked toward the rear of the boat, I heard a splash, turned, and saw a fish had swirled the surface a few feet off the ramp. As I unhooked a strap, I heard another splash and turned in time to see a trout breaking the surface. I grabbed an ultralight rod, walked down the center of the ramp, stopped inches from the edge of the water and started casting a Joe’s Flies Short Striker. In the first six casts, I caught two trout, lost two more, and had two trout strike so close to me I could see them. After several more casts and strikes, I decided it would be wise to get on the water and hit a few of my most productive spots. I caught many more trout that day, and though I can’t remember how many, I will share an encounter I had with a brown trout above eighteen inches that left a vivid impression. 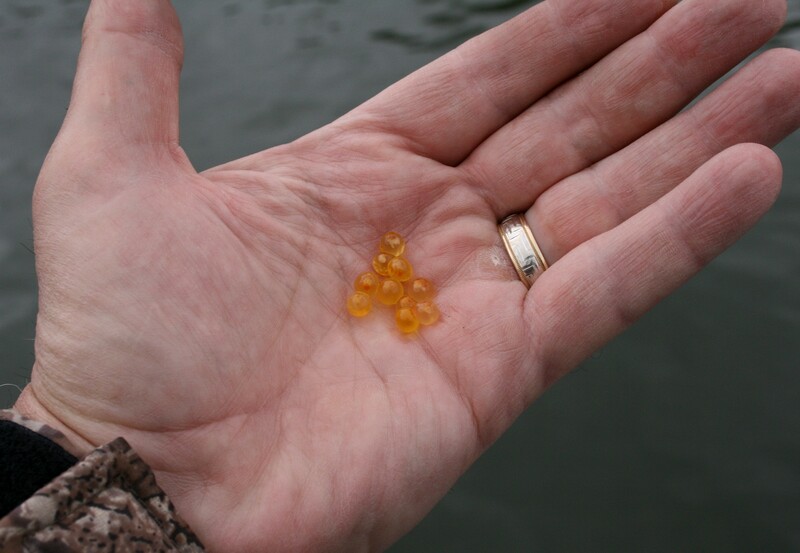 A few eggs left by an angry female brown trout after a memorable battle. spool with my hand to apply tension to the line, and prayed the fish stayed attached to the lure. The trout had a different battle plan. As slack line began pouring from the spool, the big brown suddenly jumped straight at the boat, landed on the gunwale, and ricocheted into the bottom of the boat at my feet. One would think this a glorious end to a brief and exciting battle but it quickly became apparent the fish intended to use the lure full of sharp hooks as a billy club on my ankles. I’m sure I could have won a cash prize if someone had been there to film the dance I performed. I can’t remember all the steps but in seconds found myself perched on an elevated platform on the rear corner of the boat. The trout realized I had escaped so it headed for a wall-mounted storage net and tangled both treble hooks in the netting. With trembling hands, I carefully removed the hooks from the lure with split-ring pliers as the big fish stared at me with malice in her eyes. I was concerned for the fish’s welfare as I lowered her back in the water but she quickly flipped her tail, splashing water in my face, and disappeared into the depths. I’m not sure but I believe she had a smirk on her face as she swam away. Apparently, spawning brown trout do not like to be disturbed. 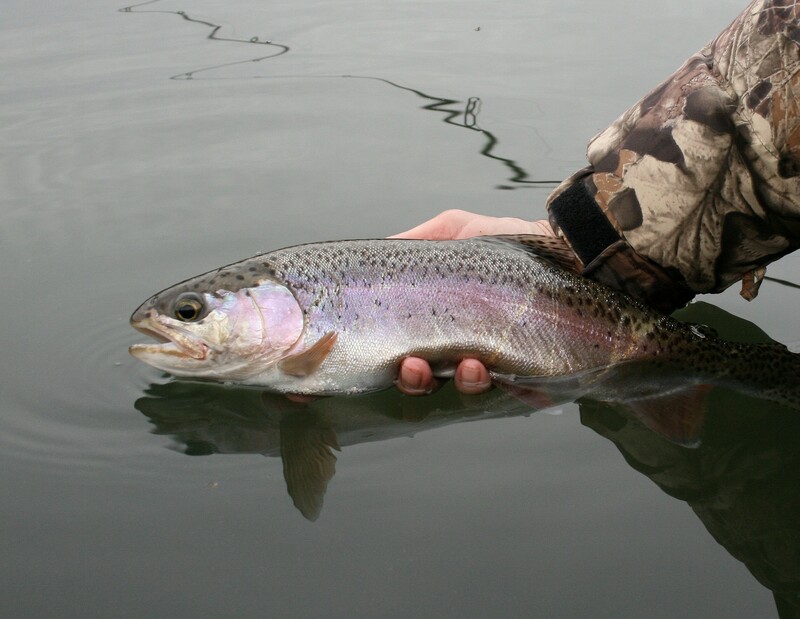 I caught this twenty-two-and-a-half inch rainbow two weeks ago on a mild, overcast day. lures so I use ultralight combos and lines of six-pound test diameter or thinner. Heavy current from generation increases water depth, reduces visibility and mandates fast retrieves to stay in contact with lures. Under these conditions three- to five-inch minnow lures are better choices because they have larger, more visible profiles and run well in swift current. Medium-action spinning combos with higher retrieve speeds and line diameters of ten-pound test or thinner match well with these lures. However, throughout the cold water period, I prefer to fish for tail-water trout when generators are off and water flow is lowest. I carry a medium-action rod and reel combo and small box of lures for those times when generation occurs while I’m there. But I target periods of no generation as my preferred time to be on the water. When wearing multiple layers of clothing, heavy boots, gloves and a life jacket is a risky time to operate a boat in swift, dangerously cold water. It’s much easier and safer to cast or troll in still water when dressed like an Arctic explorer. So I fish for larger trout in heavy current most during warmer months. One of many rainbow trout I caught recently on a Joe’s Flies Short Striker in the Potomac Coachman fly pattern. hence the name Short Striker. I’ve used Short Strikers to take trout in tail-waters, streams and stock ponds in many places using various fly patterns and blade combinations but my first choice has a size #1 gold Colorado blade and size #8 hook with the Potomac Coachman fly pattern. Some of the best trout anglers I know choose other Short Strikers as their first choice but this combination of size, blade and fly pattern has been effective in most waters I’ve fished. Whether trolling or casting, I always change lure types, sizes and colors until I find what trout strike best under current conditions. 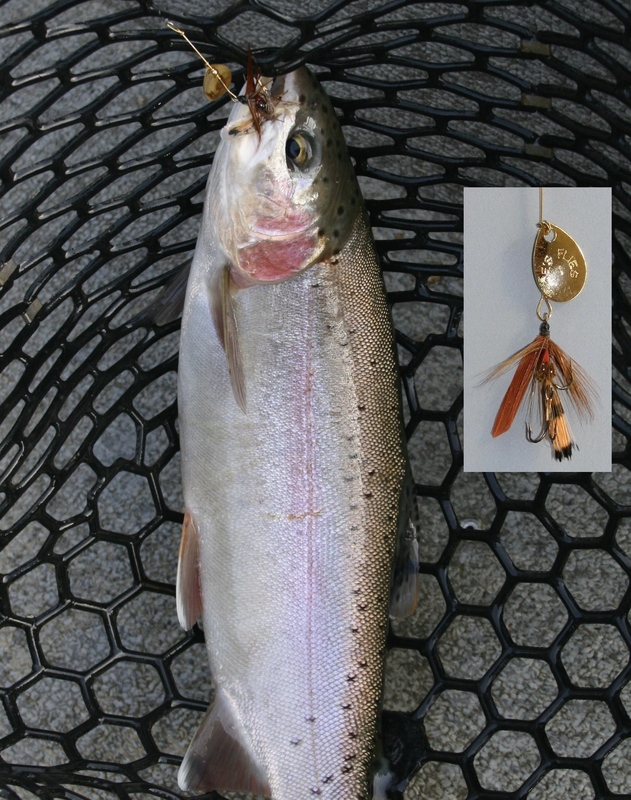 So I often troll a combination of minnow lures with this spinner fly until the fish confirm their preference. On several trips this fall, the Potomac Coachman with a gold blade has proved the best choice among many lures I tried. And though I’ve tried some proven colors of several minnow lures, the spinner fly has been the best choice for casting shallow water; the incident at the ramp is an example. If you’ve not tried Joe’s Flies Short Strikers, you can find them at any major retail store that sells fishing supplies or click the “Reliable spinner flies for trout” link at the bottom of this page to visit their Web site and order directly from them. If you’d like to learn more about fishing for winter trout with Short Strikers and minnow lures, there’s a feature story in my book in the chapter on winter fishing that describes the tackle, methods of presentation and other details I employ to catch these beautiful game fish. Don’t set around waiting on spring. Visit a tail-water near you and catch some of these active cold-water fish. Posted on December 28, 2011, in Winter Fishing. Bookmark the permalink. 3 Comments. Hello Jim and I’m glad you’re enjoying my book. 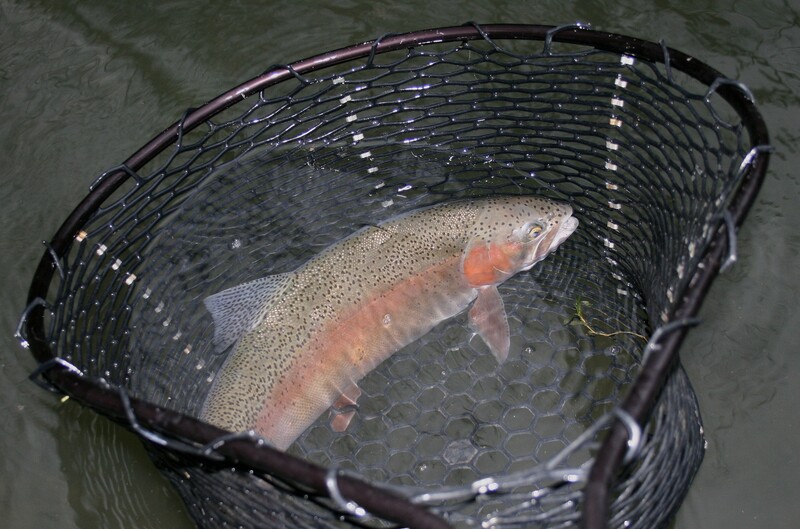 Yes, there is good trout fishing in tail-waters below dams close to you. I’ve trout fished below Cherokee but the water get’s too warm there during summer to provide optimum conditions for trout year round. But it would be convenient for you and a great place to learn because it’s stocked between November and April and should provide good fishing this time of year. Apparently the tail-waters below Douglas Dam aren’t stocked so trout are absent there. If I lived in Morristown, I’d focus on the tail-waters below Norris Lake for trout. 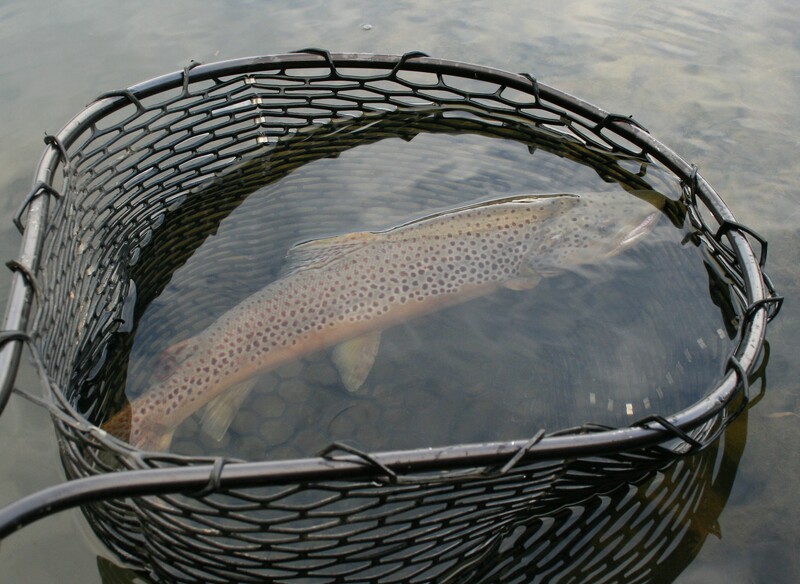 It’s listed on the TWRA website as supporting a year-round trout fishery with a higher carrying capacity and the potential to produce larger trout. It’s also one of the few tail-waters in the state where brook trout are stocked, a testament to the quality of the fishery. And the state record brown trout, a twenty-eight-plus pound giant was caught a few miles below Norris Dam. Type “Dwane Wilder Record Trout Story” in your search engine and you’ll see proof of the potential for big trout from below Norris Dam. If you decide to fish there, let me know how you do. It’s been on my list of places to go for some time. Best of luck!